Welcome to my spring laptop buyer’s guide. It should be an easy time for laptop buyers, now that we’re six months past the introduction of Microsoft’s redesigned Windows 8 operating system and laptop makers have had time to get into a new groove. Alas, I’m sorry to report, it’s still pretty confusing and frustrating to buy a new laptop, and it might be best, if you can, to wait until the fall. After the big buildup in October around Windows 8, laptop makers stumbled. They continued to offer mostly nontouchscreen models, though the new Windows was designed for touch. And the touchscreen models they built were clustered around $1,000, far more than consumers are used to paying for Windows laptops. Plus, Windows 8 itself proved confusing, because it combines two interfaces — the tabletlike “Start Screen” and the traditional Windows desktop. 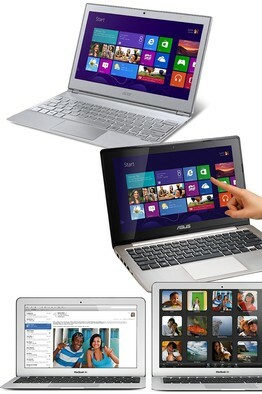 Two touchscreen models: The Acer Aspire S7, top, and an Asus S200 series model, middle. Bottom, the 11-inch and 13-inch MacBook Air. Based on conversations with laptop makers and Microsoft, I believe there will be an effort to regroup this fall, with more touchscreen models that are less costly and a forthcoming class of PCs even smaller and thinner than the current slender Ultrabooks. There also will be new chips from Intel that aim to greatly increase battery life and a refined, beefed-up version of Windows 8, code-named Windows Blue, which will be available to current buyers as a free upgrade. Recent statistics showing massive drops in laptop sales indicate consumers aren’t replacing their computers as often as in the past, partly because they now rely a lot on smartphones and tablets. But some of you will be buying new laptops this spring and summer, so here are some tips on what to look for in a machine. As usual, this guide is meant for average users doing typical tasks, not businesses, or people doing heavy-duty work like video production. Apple has led in the touchscreen market, but with phones and tablets, not computers. So its Mac models remain traditional laptops, which don’t use touchscreens. As always, they aren’t cheap: The least expensive Mac laptop is still $999. And they lack the variety of Windows PCs. But the machines are high quality, reliable, versatile computers that are far less susceptible to viruses than Windows PCs and can even run Windows quite well. The light, speedy MacBook Air is a paragon of what a capable laptop should be and I expect Macs to adopt the same new Intel processor coming soon for PCs. I reject the idea that tablets are only for content consumption, not productivity. Plenty of business is conducted on tablets daily, from work email to reviewing and editing office documents, to using sales and medical apps. Still, heavy-duty work, like the creation of large spreadsheets and presentations, is better done on laptops. If you don’t do such tasks, a tablet may suffice, but most people will want to keep a laptop around, even if they use a tablet. On a Windows 8 laptop, I strongly advise consumers to buy machines with touchscreens. The operating system will work with just a mouse or track pad, but it was designed for touch, and Microsoft intends to continue to make the touch-centric Start Screen, with its tabletlike apps, more powerful and versatile. If you only plan to use traditional Windows desktop programs, you can skip touch, but more and more PC software will be for the Start Screen. In an effort to fend off the attack on laptops from tablets, hardware makers offered a variety of convertible models designed to be both laptops and tablets. Unfortunately, these machines typically made for heavy, thick, expensive tablets. So, until convertibles appear that are thin and light enough to work well as tablets, I suggest you shun these combo devices. These are laptops from which the screen can be detached for use as a true tablet. Unlike convertibles, they work pretty well as a tablet, in addition to functioning as a laptop. One example is the Hewlett-Packard Envy x2, which sells for $600 to $700. Windows 8 takes up a lot of storage, so get a laptop with at least 500 gigabytes of hard-disk space, or if it uses a solid-state drive, at least 256GB. In combing my local Best Buy and Micro Center stores (a smaller, but high-quality chain store), I found most well-equipped, name-brand touchscreen models still hovering between $700 and $1,200. One excellent touchscreen Windows 8 Ultrabook, Acer’s S7, was $1,200 at Micro Center for a 13.3 inch model. And on May 12, Toshiba will introduce a premium touchscreen Ultrabook, called the Kirabook, starting at $1,800. There were a few — very few — bargain touchscreen models. At my Best Buy, the least costly Windows 8 touchscreen was the 11.6 inch Asus Q200e for $480. At Micro Center, a similar Asus model, the X202e, was $400 after a $100 rebate. For a high-quality, traditional laptop without a touchscreen, you can’t do much better than a MacBook Air, if you have at least $999 to spend. On the Windows side, stick with touchscreens and be prepared to spend nearly as much, or even a bit more. But if you can wait, come back in the fall.